Apple reportedly working on a 4K Apple TV box | What Hi-Fi? Under the codename "J105", Apple is rumoured to be manufacturing a TV box capable of 4K and HDR content. However, with alternatives already available in Google's Chromecast and Amazon's Fire TV, will it be enough? There have been many Apple TVs. There's the one from 2009, the one from 2014, and the one from 2015. 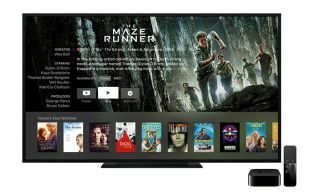 We've written about tips and tricks for it, and pit it against the Amazon Fire TV - and now it seems, we might have to do that again, as rumours grow around the release of a new 4K Apple TV. Bloomberg reports the new box will be able to stream 4K Ultra HD video and will have "more vivid colors" - which could refer to HDR support. Unfortunately, the whispers about the hardware capabilities stop there, but Apple is clearly making steps to take a stronger position as a media provider. Timothy Twerdahl joined Apple earlier this month as vice president in charge of product marketing, having previously worked as the head of Amazon Fire TV. Apple recently released a trailer for its new TV series, Carpool Karaoke, set to be available on Apple Music, and it's also planning its own TV series called "Planet of the Apps". That said, a new box will have plenty to do to take on the likes of Google's Chromecast and Chromecast Ultra, or Amazon's Fire TV Stick and 4K Fire TV. This new raft of products offer inexpensive ways access to huge libraries of HD and 4K content, via Amazon Video, Netflix, YouTube and more, whether streaming from your phone or laptop, or from the box itself. Similarly, with most 4K televisions offering many streaming services built-in to their operating systems, any new Apple TV box needs to offer a signifiantly superior experience to take precedence in the home. Still, Apple of course has plenty of experience when it comes to offering an optimised version of existing tech, from the iPod to the iPhone. Apple also has an unrivalled app library, plenty of video content, and the ability to add voice control and AI thanks to Siri. Certainly, as Apple takes aim again at the living-room, the once much-rumoured Apple TV set seems a distant memory. And as TV margins shrink, and the hardware becomes dominated by an increasingly small number of companies, it's easy to see why. Nevertheless, Apple seems keen to do something to reassert its position in the home. While Apple doesn't disclose how many Apple TVs it sells, Bloomberg reports that Apple's CFO, Luca Maestri, has said that sales "decreased year-over-year from the 2015 holiday season to this past 2016 holiday period". Will a 4K Apple TV box turn that around? We shall see.